If you read my last post, you saw the first glimpse of our master bedroom in it's current horrific state. And although we're no where near ready to start tackling it, we have plans! Or, I have plans, and Mike isn't ready to think about it since we're not actually doing it yet. Same thing. I think the overall feel I want to aim for is a mix between cottage and country. The second floor of our house is significantly less formal than the living room; the trim is painted, the doors are made of beadboard planks and have cast iron Suffolk latches instead of doorknobs. I love these original details, and I think cottage/country describes them perfectly. Now for a little trip down inspiration lane. Paula Deen Down Home from Sears. This bed would be perfect. I'm on the lookout for something similar that doesn't carry such a hefty price tag. 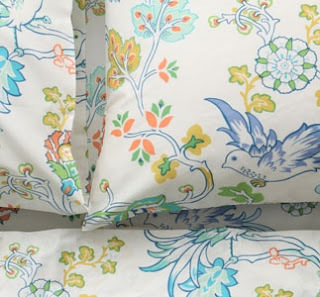 And can you picture it with pillow cases like these? Something that I'm not afraid to splurge on is a Hudson's Bay wool point strip blanket. I will have one one day! It's very classically Canadian. 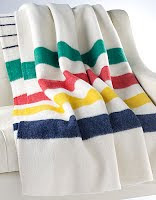 Hudson's Bay Company Multi Stripe Blanket via The Bay. With crazy pillow cases and the in-your-face stripes of the blanket, I'd keep the rest of the bedding pretty neutral. Not white - the dog is a filthy beast. 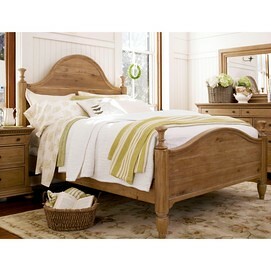 Springmaid Decca Coverlet in Chino/White via Springmaid. Instead of lamps on night stands, I like the idea of lamps on the wall over the headboard. 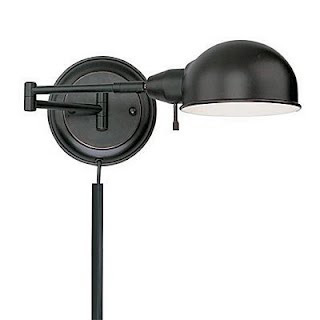 Swing Arm Wall Sconce via Lighting Universe. We're toying with the idea of a bead board ceiling. The plaster on the ceiling is not in good shape, but we're not interested in tearing it down and having the insulation from the attic create a giant mess. From left to right: SR2 Retreat - SR44 Bisque - SR68 Dreaming. Ceiling, walls, trim. I love the idea of a blue bead board ceiling - although more typical of a porch ceiling, I think it'd do just as well as a bedroom ceiling. And if we hate it? Well, it's just paint - it can be covered up! That's about as far as I've gotten in my little scheme. Well, except in my dreams we'd replace the window with a door and build a little balcony, just big enough to fit two chairs. But that's kind of embarrassing to admit because it's not really possible.